Every actor over 40 gets a “Taken” now. Just last year, Halle Berry played a mom who had to use her mini-van to rescue her son in “Kidnap,” and now it’s Gabrielle Union’s turn in “Breaking In,” just in time for Mother’s Day. Director James McTeigue (2012’s “The Raven”) and screenwriter Ryan Engle (2018’s “Rampage”) concoct a simple but nifty reversal of the usual home-invasion tropes by having a mother trying to break back into her home where the intruders are holding her children, but that is about it. 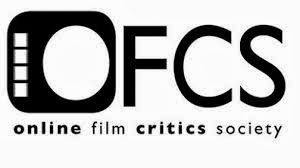 Without being entirely different from 2002’s “Panic Room,” “Breaking In” is a bare-minimum home-invasion thriller that delivers commercial crowd-pleasing satisfaction here and there, but without fully utilizing its gizmos-filled location, it’s never as thrilling or as tautly constructed as it could have been. 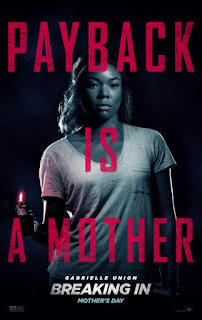 If it has anything going for it, it’s Gabrielle Union, who’s fun to watch in a take-charge lead role like John McClane with a touch of MacGyver. 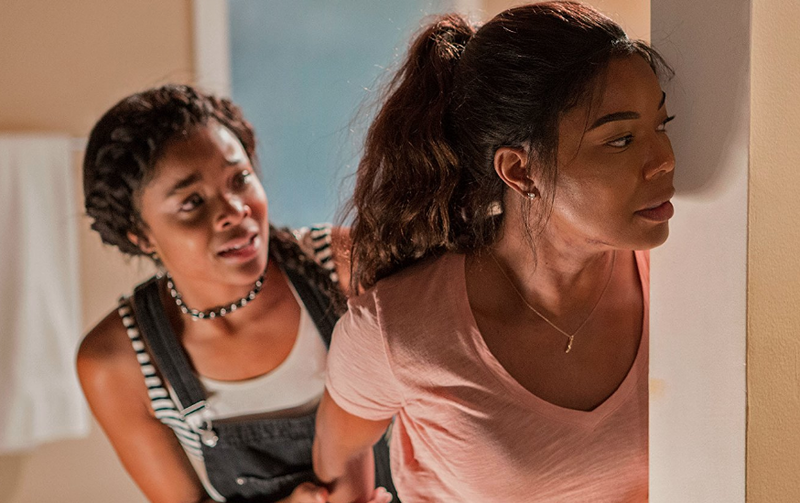 Following the untimely death of her estranged father, Shaun Russell (Gabrielle Union) takes her kids, teenager Jasmine (Ajiona Alexus) and pre-teen Glover (Seth Carr), back to her childhood home in the isolated Wisconsin countryside for the weekend to get ready to put it on the market. To Shaun’s surprise, her former abode is now a high-tech fortress retrofitted like a paranoid millionaire’s manse with a tightly elaborate security system, surveillance cameras in every room, motion sensors, and retractable shields on the windows. While Glover plays with the house’s bells and whistles inside and Jasmine texts away in her bedroom, Shaun is confronted outside by an intruder (Mark Furze), but when she fends him off, she runs to the backyard door of the house to discover her children are being held hostage by three more burglars, Eddie (Billy Burke), Sam (Levi Meaden) and Duncan (Richard Cabral), who came to crack open a safe that holds $4 million. As a mother, Shaun will stop at nothing until her kids are safe, but the burglars shouldn't have poked the bear. As “Breaking In” plays out, one keeps hoping it will break out of the standard thriller mold and dish out the craziness. Director James McTeigue does sufficiently set up the geography of the house, so the viewer knows where people are spatially located to one another, and employs a little style on occasion, like an appropriate use of slow-motion as Shaun tumbles down a hill. A thriller like this can collapse under too much scrutiny, but in the moment, it does work as a nitty-gritty game of cat and mouse, especially when Shaun does break back into the house and outsmarts the numbskulled intruders. Either the film is trying to subvert expectations of Chekhov’s Gun, or it just doesn’t want to exploit certain setups, like a drone that doesn’t get much of a payoff and a circular saw in the garage that is shown but never used. 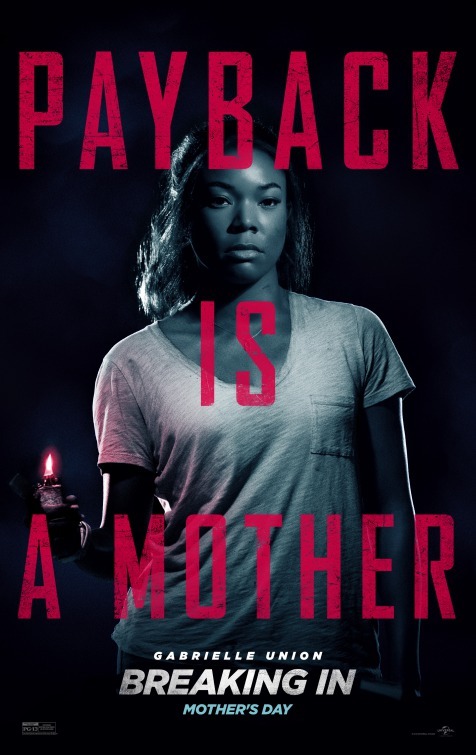 Noticeably cut from an R-rating as if one is watching an edited version on cable, the film shies away from some of the bloodier bursts of violence, and yet still comes off pretty vicious, but even more so, a few uses of the F-words are dubbed over with “frickin’,” allowing Gabrielle Union to finally use the PG-13 rating’s allowance of one F-word. Shaun is a mother and a force of nature when her and her family are threatened, but as character, she is slimly defined. This doesn’t really put a dent in the trashily entertaining proceedings, but giving its central heroine more meaty layers and backstory might have turned this watchable but disposable high-concept fare that is all concept into something more. 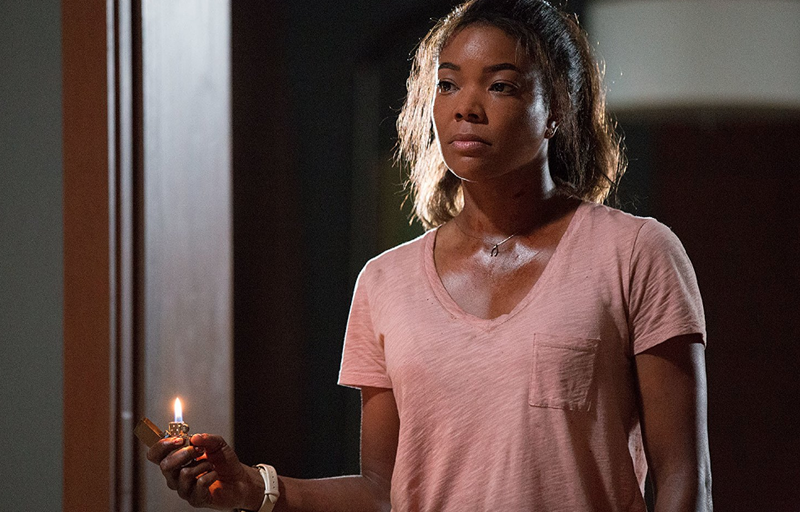 All the same, Gabrielle Union commits physically and emotionally, and even brings conviction to the clap-worthy line, “You broke into the wrong house.” When these bad guys inevitably get what’s coming to them, it’s hard not to be a cheerleader for Shaun when she does every smart decision most characters fail to do in this type of movie. For one, she uses the sharp stem of a broken wine glass to protect herself, and later on, she reverses a pick-up truck to mow one of them over. Union gives “Breaking In” most of its oomph, but even with a film that has no delusions of grandeur over what it wants to achieve, it all feels a little too familiar that one can’t help but think of other movies that did it better with much greater tension and invention. "Panic Room" aside, both 2016’s “Hush” and “Don’t Breathe” immediately spring to mind.